Polar bike computer M460 (HR): Cycling of highest level! GPS bike computer with advanced capacity for performance measuring and many important cycling functions for training control! Integration to Strava Live segments as well as other approved training Apps like Trainingpeaks, Stages Cycling or RotoR as well! Strava Live segments: With Strava Live segments, your cycling tours make even more fun. Your M460 warns you, when you come close to one of the favoured Strava segments, gives you real-time data of your performance, and displays your results, when you have finished the segment. There is hardly more motivation / competition! 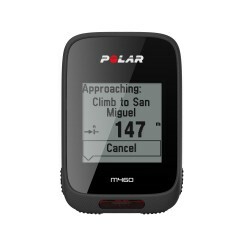 The Polar M460 includes a free 60-days Strava Premium membership! Performance optimised "Smart Coaching" functions (a chest strap needs to be worn! ), of it orthostatic test, fitness test, recovery state, and many more! Integrated Polar GPS receiver plus barometer for recording route, speed, distance, height, etc.! 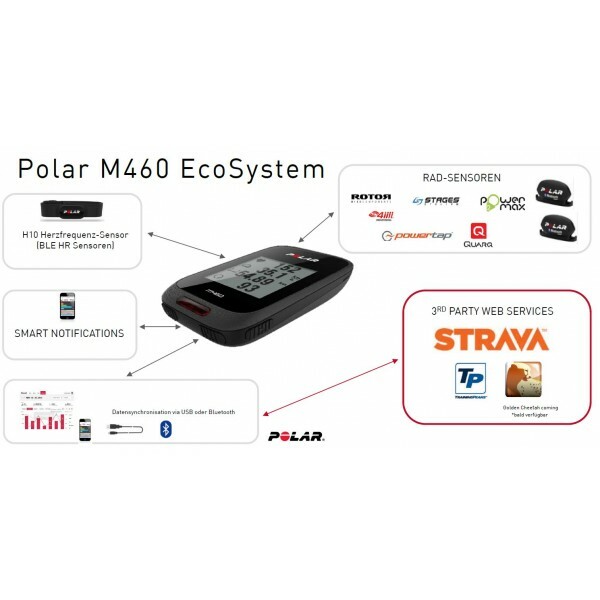 >The Polar M460 is a GPS bike computer with an advanced capacity for performance measuring, Polar Smart Coaching, and support of the Strava Live segments. In combination with the Polar Smart Coaching functions as well as the support to the Strava Live segments, the Polar bike computer M460 (HR) is designed for performance-oriented, ambitious sportsmen. Thanks to the integration possibility of external Apps like Strava, Trainingpeaks, Stages Cycling or RotoR, which all of them are highly appreciated among pros, the performance analysis can be done more precisely. Furthermore, the trips with the Strava Live segments do not only increase the fun factor but they are also a great motivation. Because Strava Live segments offer the possibility to compete live against the best in the respective segment while being on the road. How does that work? A segment stands for a certain track segment, which has been created or compiled by your own or by another sportsman. Most often it is a track segment of a special kind like ascents, hills, sprints or laps. Highscore lists of the sportsmen are given for every segment, which you can use for competing by running or cycling. In the so-called leaderboard or in your personal data, you get practical information about the covered segments (length of the segment, average ascent, altimetres, etc.) as well as your training performances per segment (average heart rate, average speed, training time, etc.). These are displayed in comparison to the performances of other sportsmen, team colleagues or friends. That's why the comparability or the idea of competition are the special feature of Strava Live Segments, which can also be used with the Polar bike computer M460 (HR) now. No matter whether it's training or competition - the Polar bike computer M460 (HR) offers wide-range functions which contribute to the improvement of the own performance and fitness. 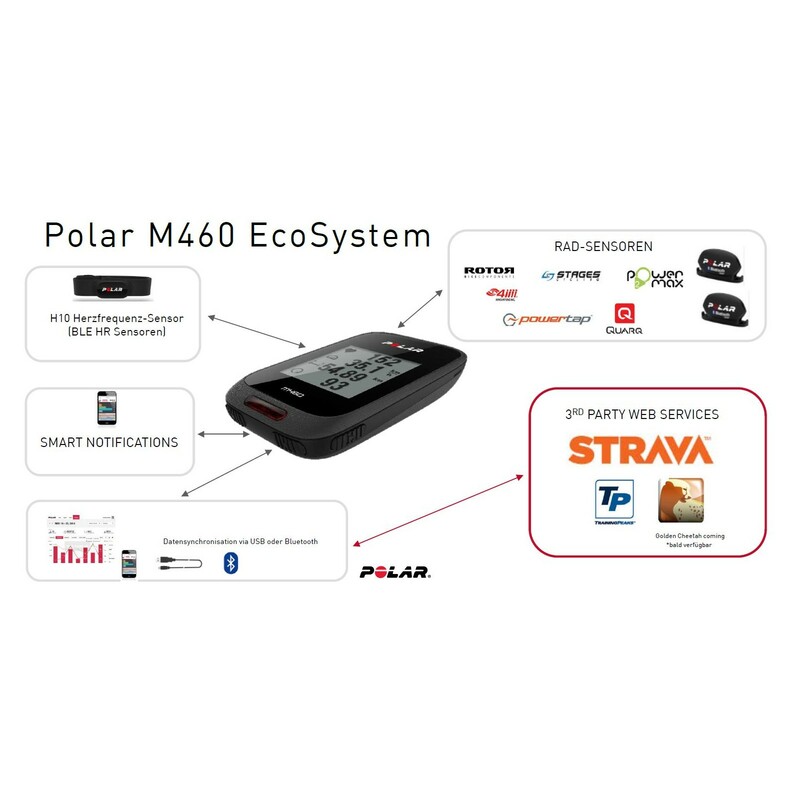 Due to the integrated GPS sensor, the Polar bike computer M460 (HR) records precise data like route, speed, and distance and makes them available for a later analysis. Those many "Smart Coaching" functions guarantee a successful and performance-oriented training without under or overexertion. Here, an integrated fitness test determines your fitness level first and recommends then the optimal heart rate zone depending upon your training target, in which you should do your training to achieve the target. After your activity, the Polar bike computer M460 (HR) gives you a feedback about the training use. As a result, the Polar bike computer M460 (HR) is equipped with many important cycling functions for training control, which make it the perfect companion for cycling and mountain biking. In addition, the Smart Notifications (* from Android 5.0) keep you up to date: You get messages of incoming calls, messages, push-messages from Apps for social networks and you can watch those on the display of your Polar M460 bike computer.